Back in the day, scientists did not know not only how the Sun shines and produces heat but also what it comprises. It was already exasperating to detect matter, even on Earth, and therefore people had thought that it is impossible to detect and define matter out of Earth except for some distinguished researchers whose work culminated in the investigation of the solar spectrum. Not surprisingly, determining the chemical composition of the Sun was a problem which is hard to surmount. As Auguste Comte wrote in 1835, ‘there is no conceivable means by which we shall one day determine the chemical composition of the stars’. Nevertheless, the first spark of the inexorable process of determining the chemical composition of the Sun ignited by a different field of science – optics. First of all, to better comprehend that process, we need to understand the dark lines in the solar spectrum which is known as Fraunhofer lines today. The German Joseph von Fraunhofer, who was able to produce much more detailed spectra in the second decade of the 19th century and eventually identified 574 separate lines(1), could not extrapolate the relation between the chemicals and these lines from his experiments. The inaugural hint for the answer came from the work of Robert Bunsen and Gustav Kirchoff in Germany. The Bunsen burner combines oxygen and the inflammable gas in a controlled way that produces a clear flame ideal for use in the ‘flame test’, by which substances are identified by the colour they give to flame(2). In the beginning, they only used coloured filters to calibrate their observations to identify gases. But, Kirchhoff proposed that using spectroscopy would allow them to make a more detailed analysis of the substance. 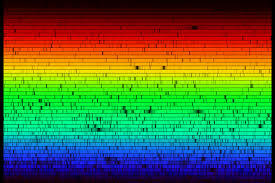 Hence, together, they built the first spectroscope to analyze and view the spectrum of the substance. And, they analyzed the distinctive lines, which are in the spectrum at precise wavelengths, radiated by such hot object using spectroscopy. In this way, they were able to analyze any light source radiating from anywhere as if they are near it and they tried to detect the composition of the Sun by analyzing the spectrum of it(the solar spectrum) even though that was considered as madness in their time. But, it was only the beginning of the journey to find the composition of the Sun and other stars. 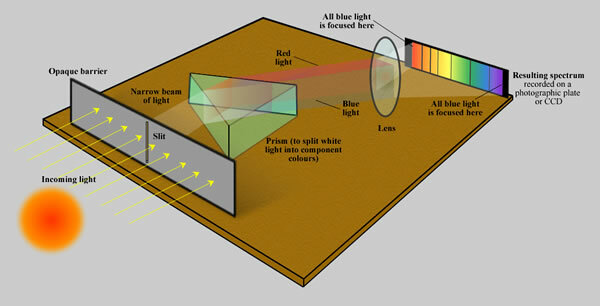 Joseph Lockyer quickly picked up on the developments in spectroscopy being made by Bunsen and Kirchhoff and applied those techniques to his solar studies(3). On 20 October 1868, he observed the outer layers of the Sun(chromosphere) and detected a yellow line associated with a previously unknown element caused the darkness of the sunspots by absorbing the hotter gas below, which he called helium derived from the Greek word for the Sun – Helios. Unlike helium, the existence of hydrogen in the Sun had already been known by astronomers in the day. But, a distinguished scientist – Cecilia Payne – proposed that the Sun and stars are made almost entirely of hydrogen and helium according to her analysis about the complicated pattern of hundreds of Fraunhofer lines and the proportion of different elements in significant stages of ionization(4) although it was unimaginable in her time. I wanted to share you how astronomers detected the composition of the Sun and stars in a short article. For more information, you can inspect my reference book from here. (1)	Gribbin, Jon. "Prehistory: Spectra and the nature of the stars.” 13.8: The quest to find the true age of the universe and the theory of everything. London: Icon Books, 2015. 23. Print. (2)	Gribbin, Jon. "Prehistory: Spectra and the nature of the stars.” 13.8: The quest to find the true age of the universe and the theory of everything. London: Icon Books, 2015. 24. Print. (3)	Gribbin, Jon. "Prehistory: Spectra and the nature of the stars.” 13.8: The quest to find the true age of the universe and the theory of everything. London: Icon Books, 2015. 26. Print. (4)	Gribbin, Jon. "Prehistory: Spectra and the nature of the stars.” 13.8: The quest to find the true age of the universe and the theory of everything. London: Icon Books, 2015. 30. Print.